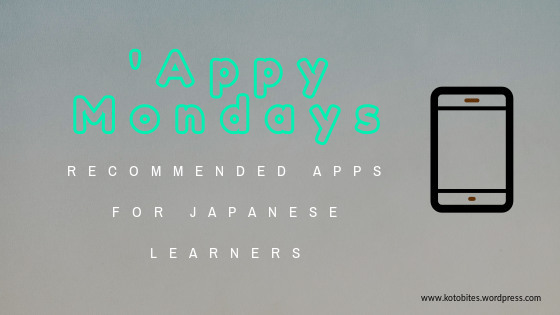 Welcome to ‘Appy Mondays, my series of app reviews relating to Japanese language study. Today’s app review is of the JLPT listening practice app Ohayou. When you first log into the app, you have to create an account with an email and password or link the app to a social media account. I decided to go with the first option. Whichever you choose, the app should automatically log you in whenever you access it after this. The listening tests are grouped by JLPT level, and on the far right there are non-JLPT specific listening exercises too. Each JLPT level has a number of tests, which have to be downloaded before they can be accessed. Fortunately, downloading is usually very quick. The above table, taken from the official JLPT website, shows the different types of listening questions included at each level of the exam. Depending on the level of the JLPT you are working towards, the types of listening questions you get in the exam will vary. Fortunately, the Ohayou app has pretty much all of the listening question types in the test. The non-JLPT listening exercises include practice for hiragana and katakana, as well as counting and calculations in Japanese. Once the test has been downloaded, you can jump into listening practice. Each test has 20 questions which follow the format of the JLPT test, which are multiple choice. For lower levels of the JLPT the answers may be pictures, but they will be entirely in Japanese otherwise. Clicking the ‘Check’ button after listening to the question show you if you answered correctly. You can then choose to listen to the question again or continue on to the next one. You can also rewind or fast forward 10 or 20 seconds using the arrows, which is really helpful if you need to hear a particular sentence again. Ohayou is a very convenient app for JLPT listening practice and is a great app to help build confidence for the listening section of the exam. For all of the listening exercises I tried, the audio was very clear too. One of my biggest tips for the listening section of the JLPT is to familiarise yourself with the format of the exam. The listening comprehension tests are the same as those you find in the JLPT so anyone preparing to take the test (especially for the first time) will find this very useful. The non-JLPT exercises were a bit of a mixed bag for me. I thought that the hiragana and katakana tests were good – I would recommend them to those who had just finished learning the scripts and want to test their listening skills. I tried the tests relating to counters, which I think are useful especially for reviewing common but irregular counters like ひとり and ここのつ, but the audio quality was not as good as the JLPT tests. It sounded as if the audio had been recorded from someone’s TV or perhaps had been recorded with the TV on in the background. Needless to say, this kind of distracting noise could just as easily happen in a real-life situation, but I found it a bit disappointing. I need to mention that whilst the app is free to use, additional features can be bought with for money, although these features can be ‘paid’ for using points you gain by using the app. You can pay 400 points (US $2.99) to remove ads permanently, and 1000 points (US $4.99) to view all transcripts and access to one-click definitions of any word. For once, it is nice to come across a freemium app that does not require a monthly subscription! Completing the tests for the first time earned me 2 points each, so at that rate earning enough points to unlock the premium features in full is probably near impossible without paying for them. There was also the option to earn 5 points by watching a video ad, but despite watching a couple of ads my points total never increased. In the app’s defense, it is possible to purchase the transcript for individual questions or tests. So if there is a particular test that you are struggling with, you can spend 15 points to purchase the transcript. I would be wary about becoming overly reliant on transcripts for listening practice, as you will not have that benefit in the actual test. Generally, I found that if I got any answers wrong, listening to the question a couple more times made it clear where I went wrong. I can’t really see the value of paying the $2.99 to remove ads – I didn’t think that the ads were intrusive enough to justify it. Having access to all transcripts for $4.99 could be useful, especially if you are planning on taking all levels of the JLPT in turn (and so would be using the app quite a lot). If you are interested in checking the app out, it is available in the Apple store and Google Play store. Have you tried this app out? Are you aware of a better alternative? Let me know in the comments! Longtime readers will know that I review language learning apps on this blog fairly often. However, in reality there are only a small number of apps that I think are the best for people studying Japanese. Many of them I wish had been around when I was a beginner! For that reason, I thought I would put together a list of the best Android apps out there for learning Japanese! 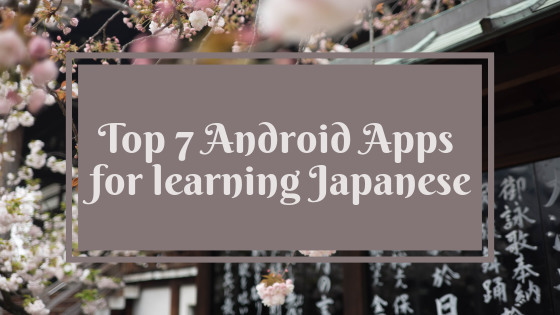 Choosing just 7 was quite tricky, but I have tried to include apps for studying Japanese vocabulary, kanji and grammar which are useful at any level. The best thing is that these apps are either free or available at a low cost. As I almost exclusively use Android devices, this list was made with Android users in mind. Fortunately, many of these are available on the Apple Store too. If you like the idea of using an app like Duolingo, then I recommend trying out Lingodeer instead. Lingodeer was initially aimed at those learning Mandarin, Korean or Japanese (French, Spanish, German, Portuguese and Vietnamese are also available) and so the lessons are tailored towards these languages in a better way than Duolingo. Lingodeer starts by teaching hiragana and katakana, which makes it a great choice for absolute beginners. Like Duolingo, the app has many lessons increasing in complexity covering a number of different themes. Each lesson starts out with some grammar notes (called ‘Learning Tips’), then a number of smaller topics covering a few grammar points and vocabulary under the given theme. You also have the ability to toggle the use of kanji, furigana and romaji within the lessons if you wish. When it comes to the lesson quizzes, the app tests your understanding in a few different ways. Successfully passing the quizzes earns you XP, and allows you to move on to the next lesson. Similarly, there isn’t a heavy reliance on English for learning new vocabulary; instead, the focus is on using lots of images to convey meanings. There is a ‘Test Out’ feature which allows you to skip ahead if you can pass the tests. I wouldn’t necessarily recommend using Lingodeer as a resource on its own, but I think it is a great way to supplement learning using another textbook. Alternatively, I think it is a nice app to use if you have taken a break from Japanese and perhaps want to review the basics before starting new material. This app has a textbook style app that takes you through hiragana, katakana and the basics of Japanese grammar. All aspects of the language are explained in a very clear and straightforward manner, imparting a lot of information designed to give as much context as possible to what you are learning. The grammar lessons are also supplemented with relevant information on Japanese culture – you cannot understand the language without understanding the culture after all! A lot of time and effort has clearly gone into Human Japanese – the quality of the app is great. All example sentences have crisp audio and example sentences have ‘ingredients’ which break down the sentence into its component parts, which is useful as sentences get more complex. The full version of the app is not free and requires a one-off payment, but there is plenty of free content for Japanese newbies to work through to see if the app is appropriate for them before making a commitment. Looking at the content of the textbook, Human Japanese provides a solid foundation on which learners can continue to build on. I’ve written about Human Japanese in a previous post so I recommend checking that out if you would like to learn more. I have tried a number of free Japanese dictionary apps available on Android, but Akebi is by far my favourite. Again, this is another app that I have written a post about on this blog. Full functionality offline, perfect for when I am avoiding the internet during study sessions! One of my favourite features relates to Anki; whenever I use the app to look up new words, I can immediately add them to a flashcard deck of my choice in Anki to review later. Overall, I find that it has the right balance of user-friendly interface and powerful features that make it the perfect companion for Japanese learners at all levels. One of the biggest issues Japanese learners tend to have is lack of access to native speakers. Fortunately, language exchange apps like HelloTalk are the next best thing to address this issue. When you sign up for an account, you can select the languages you are interested in learning, as well as the languages you can speak. You can then post a message to native speakers of the language you are learning and find an exchange partner. When speaking with your language partner, you can post in your target language or record audio/ have a video call. HelloTalk has expanded into a sort of social network for language learners. You can now post status updates on your profile called ‘Moments’, which other members can correct any language mistakes for you. The above Youtube video by Reina Scully gives a good overview of how the app can be used to study Japanese. HelloTalk has a couple of handy features for language learners. For example, as Reina mentions in her video, the Translate feature allows you to see translations from your target language by tapping any word or phrase. In addition, the Notepad feature also enables you to save a message or recording for later practice. I think HelloTalk is a great way to find a language partner or even to practice your reading skills by reading other users’ Moments. Reading in Japanese can be a scary experience at first, but TangoRisto is a great app to build your confidence. TangoRisto draws together articles from NHK News Easy among other sources which you can read via the app. As you can see from the screenshots, the interface is crisp, clean and very user-friendly. Once in an article, a quick tap of a word brings up its reading and meaning. Like Akebi, tapping a conjugated verb will bring up the dictionary form of the verb with a note to indicate the form it has within the text (eg. passive tense, past tense). You can then bookmark these words to revise in the Vocabulary Review part of the app. I like the ability to only highlight and/or show the furigana for words at certain JLPT levels as chosen in the settings, as well as the ability to save articles for offline reading. There is also a Text Analyzer tool, where you can paste Japanese text into the textbox; by then clicking ‘Analyze’, you can click on any word to find its readings and meanings. Considering that this app is free to use, it is a quality resource for Japanese reading practice. It is definitely an app that I wish had been around sooner, especially when preparing for the JLPT tests! I have a post reviewing TangoRisto which might be worth reading if you want to know more about the app. I haven’t always been a fan of Anki, but it is on my list because when used correctly it can be a very powerful tool. Whilst there is a free Anki app available on Android, Anki is available on a number of mobile and desktop platforms. Anki (anki/暗記 is the Japanese word for ‘memorisation’) is a spaced repetition flashcard app that has a high degree of customisation. Putting together your own flashcard decks tailored to the type of Japanese content you want to study (ie. from your favourite TV show, video game or novel) is a great way to learn Japanese and stay motivated. There is a bit of time required to experiment with what kind of flashcard set up works best for you. If making your own flashcard decks sounds like too much trouble, there are some great flashcard decks available for download via the Shared Decks. Some of my favourite shared decks are the Kanji Damage deck and the Core 2000 vocabulary decks. This video by Landon Epps gives a nice overview of some of the features Anki has and how Japanese learners can use it to review vocabulary. Anki is a great app because it can be used to help memorise all sorts of things, not just the Japanese language. If you like looking at data, there are all sorts of statistics you can look into regarding your learning and progress for each flashcard deck. If you are looking for an app to specifically help you with kanji, look no further than Kanji Study. I love the user interface, and there are so many features to help you customise your kanji learning experience. You can choose to tackle kanji in any order of your choice, but the default is the order in which Japanese children learn Joyo kanji at school. You can then break down each level into smaller groups of your choice. In the ‘Study’ mode, each kanji has its own page showing the stroke order, radicals, common readings, useful vocabulary and example sentences to help reinforce the meaning. If you long press a word, you then get the option to add it to an Anki deck or look it up via another website such as jisho.org – both very useful features! You can then choose to review the kanji via flashcards, multiple choice quizzes or writing challenges. These tests are highly customisable so that you can tailor your study sessions to focus on your weaknesses. The app also allows you to practice writing kanji. I like that the app uses a very readable kanji font which is much closer to how kanji would be handwritten rather than a typed font. It is possible to set a daily study target, and you can set notification reminders to make sure you don’t miss a study session. The beginner level kanji content is free, however access to all kanji requires a one-off cost of £11.99. All in all, I highly recommend this app because the quality of the app is top-notch. HiNative is fairly similar to Hello Talk, but I find HiNative better for learning about the current trends or asking questions about the culture of your target language. You can read my full review of HiNative here. If you prefer an app that makes use of spaced repetition with a more user-friendly interface, then I recommend checking out Memrise or iKnow. Memrise has its own starter courses for the Japanese language, however, I cannot comment on their quality as I have not tried this out for myself yet. Instead, I like to use the Memrise app to study some of the courses created by other users for certain aspects of Japanese, such as JTalkOnline’s keigo course. Recently Memrise has made it difficult to search for these user-generated vocabulary courses (via the app anyway – they are still easy to find via the website), which is a slight annoyance. iKnow requires a monthly subscription (a free trial is available), but I think the Core 1000/ 3000/ 6000 vocabulary decks help build a good grounding in Japanese knowledge if you are not interested in making your own vocabulary flashcards. Tangorin is another free dictionary app available on both Android and iOS, which also works fully offline. Mondo is another reading assistant app aimed to help Japanese learners. Mondo tends to pull its reading content from different sources compared to TangoRisto, and there is some original articles and dialogues that can only be read on the app. I’ve covered how Mondo works in an earlier blog post. Welcome to my series of app reviews relating to Japanese language study. Today’s app review is of the Japanese version of the foreign language audiobook app Beelinguapp. Beelinguapp is a reading app aimed at helping language learners to improve their reading skills. The apps allows you to read a number of stories available at Beginners, Intermediate and Advanced level. Besides Japanese, Beelinguapp is available for French, Russian, Portuguese, Spanish, German, Chinese, Hindi, Turkish, English, Arabic, Italian and Korean. The app is host to a range of stories available for you to study. The selection is mostly fairy tales and well-known children’s stories, although there are also some non-fiction articles on topics including culture and science. Not all articles are available for free, as indicated by the currency signs in the top right corner. Click on an individual story to download and add it to your collection. Opening up the story from your collection then brings up the text in two languages of your choice (I was using Japanese-English, but you can choose any two languages from the ones I listed earlier). The story comes with full audio which can be adjusted for speed to your liking. In the Karaoke Reading mode, the sentence being spoken is highlighted as you go along, making it very easy to follow. You can click on the sentence to hear that specific sentence on its own. Option to toggle English translation on or off if you wish. You can also set the app so that the target language is in one window, and the English is in the other (known as Side by Side Reading). By long pressing a word or phrase, you can choose to add it to your Glossary for viewing later. There isn’t a dictionary in the free version, but you can add your own notes alongside each word (so you could, in theory, look up the words separately and add the furigana readings and English translation yourself). A handy feature is that you do not need to have the app fully open if you just want to listen to the stories; you can happily use your phone for other things whilst listening to the audio. At the end of each story, there are reading comprehension quizzes in the target language to test your understanding. Like most apps nowadays, Beelinguapp is a freemium app. The Premium version has no adverts, new texts added weekly and the ability to translate individual words. For these extra benefits, Premium membership costs £13.49 for the year, or £3.09 per month (the first month is often discounted). There is a nice choice of stories/ articles on offer – even for the free version of the app, there is a fair amount of variety. You can tell that the app was made with language learners in mind; the app itself is a joy to use. On the other hand, the main problems for Beelinguapp for me are the difficulty of the texts and the lack of furigana. I’m not sure how the difficulty levels were decided on as the ‘Beginner’ texts were pretty tricky (at least for Japanese) in terms of vocabulary and grammar. To some extent, this is down to the content of children’s stories not always being everyday language. Having the audio and English translation helps, but with the English translation not being literal, it would be very tricky for beginners to parse sentences. I think that in order to improve the reading experience for Japanese learners of all levels, the ability to turn furigana on alongside kanji would be necessary. Without furigana, I feel that the learning curve for the content available is just too steep for beginner learners in particular. Japanese learners who are already at an intermediate level might find this app sufficient for practicing their reading, especially if following the tadoku method. When it comes to Japanese study in particular, Beelinguapp suffers from the same issue as the Drops app I reviewed previously. The same app is available in different languages, but due to the different writing system and word order, this one-size-fits-all model of language learning app doesn’t work for Japanese as well. I suspect Beelinguapp would work better for languages that are more closely related than English and Japanese. The dictionary being behind a paywall is a frustrating choice, as for me, the benefit of using reading apps like Tangoristo and Mondo is that you can use the app to study without having to have a dictionary with you to look up the words you do not know. Ultimately, if you are looking for an app to practice your Japanese reading, I would recommend these two apps over Beelinguapp (some of Mondo’s articles come with audio too). As an audiobook app, I think it does work quite well for those who like to practice dictation or shadowing thanks to the clear audio. I do not know of any other audiobook apps that are aimed at language learners, so I do feel that it goes some way to filling a gap in the market. Overall, the free option is sufficient in variety and features to be a useful app for listening practice – just be prepared to have a dictionary at hand! Welcome to my series of app reviews relating to Japanese language study. Today’s app review is of the Japanese version of the language learning app Drops. Whilst I do make use of Anki for learning kanji and grammar, I have never personally found it as effective for studying vocabulary. I was looking around for other apps for learning vocabulary and came across Drops, a free language learning app that has a number of language options (28 languages in total!) including Japanese. What sets Drops apart from other apps you may have tried is its highly visual interface which focuses on pictures to help you learn the vocabulary. Studying in the way feels like a more exciting way to study compared to your usual flashcard app. Vocabulary is split into a number of topics such as family members, travel, shopping, and occupations. When you decide on a topic, new vocabulary is presented which you can drag downwards to study or upwards to skip if you already know it. The new piece of vocabulary is linked to a certain image which helps convey its meaning – you will also get the English but it will not be displayed unless you press and hold the image. All vocabulary comes with Japanese audio too. The words you have studied are then added to a list known as Collections.By swiping across from the main menu, you can quickly check this list where the vocabulary you have learned is grouped by topic. The app keeps track of your progress and will display this at the end of each study session. Keeping up a learning streak unlocks rewards such as extra study time. Language mission: choose from enthusiast/ traveller/ business/ student/ romantic. The Japanese version of the app has options to study hiragana and katakana, in addition to the topics. You also have the ability to add romaji and turn kanji on or off if you like. I’ve been using it for a couple of weeks and I think that as a vocabulary focused app, it does a pretty good job at testing your recall of vocabulary in different ways. The use of images to convey meaning is clever because it means that you spend less time thinking about the English equivalent of the word you are learning, and more about the Japanese. While not a complaint, I found that sometimes it would have helped to see certain words in context. This was especially true when I was studying the ‘Emotions’ topic where a lot of the words which are usually adjectives in English are verb phrases in Japanese. For example, angry was taught as 怒(おこ)っている; if I was a newbie to Japanese I might not realise that 怒っている is not actually an adjective but a conjugated form of the verb 怒る. In these cases, having the context of how they are used within sentences is more important and therefore it is a good idea to look up how these words are actually used. The app has a ‘freemium’ model, meaning that you have access to most of its features but free users are restricted to how long they can use the app for. There are 98 topics in total, and free members have access to a good amount of these. As a free user, you have 5 minutes to study the vocab, which you can increase by regularly using the app or watching advertisements. The ‘Curious’ premium access grants you 15 minutes use of the app every day and costs £2.49 a month or £16.99 a year. The ‘Genius’ premium access for unlimited use of the app across all 28 languages will set you back £6.99 a month, £45.99 a year or you can make a one-off payment of £59.99 (discounted from £109.99 at the time of writing). In my opinion, this is a lot of money for an app that is solely focused on vocabulary; you will also outgrow the app once you have covered all of the topics offered. For the free content though, I think it is a nice way of getting in 5 minutes of vocabulary practice and also offers a nice change from other flashcard apps. It also offers a good way to review hiragana and katakana if you are studying them currently. Apps for learning Japanese tend to focus on a certain aspect of the language, such as learning kana or learning vocabulary. This is fine as a supplement to classes or following a textbook, but not so much when self-studying. There are few apps that offer a more comprehensive approach from the very beginning, and Human Japanese is one of them. Whilst I wouldn’t suggest solely relying on one resource, Human Japanese is free at the earlier levels (called Human Japanese Lite) and is a pretty good alternative to one of the popular textbooks. The app starts from the very beginning, starting off by familiarizing you with the sounds of Japanese and how they differ from English. The app then takes you through hiragana before moving on to basic Japanese grammar and vocabulary across 44 chapters. You must complete each chapter before moving on with no option to skip (although this can be changed in the settings). At the end of each chapter, there is a quiz to test your learning. I would say that the app does a good job of covering reading, writing, speaking and listening equally. One of the main advantages of using an app over a textbook when self-studying is having audio integrated into the app; Human Japanese takes advantage of this by having lots of example sentences and audio. I think this is a good choice for those who have had no prior experience learning Japanese (or any language for that matter) as it takes you through the basics of Japanese whilst imparting a lot of relevant and useful information along the way. This does mean that the app is text heavy, which could well be intimidating and it may not feel like you are making progress as quickly. Even so, I highly recommend this for newcomers to Japanese who are intending to study the language in some depth. There are a lot of things explained in the earlier chapters that I wish I had learned from the very beginning! One aspect to Human Japanese that I like is that once downloaded the app can be run entirely offline, which reduces the temptation to go online and get distracted. The lite version gives you access to the first 8 chapters or so – if you like these chapters, you can purchase the full app for £9.99. The app is available on Android, Apple Store, Windows Phone, PC & Mac. I suggest taking advantage of the ‘Sneak Peek’ feature and look at the previews of each chapter (especially if you have already started studying Japanese). There is also a Human Japanese Intermediate which may be suitable if you have already studied the basics – the official website has chapter lists to give you an idea of which app may be the best for you. The intermediate version of the app probably finishes covering the main aspects of grammar for JLPT N5 and a bit of JLPT N4, but also has chapters on things like sentence ending particles -の/ んです, よ, な which are often left to a later stage of Japanese learning. I have always intended to talk about Akebi on this blog as I have used it consistently for several years when I do not have my electronic dictionary to hand. 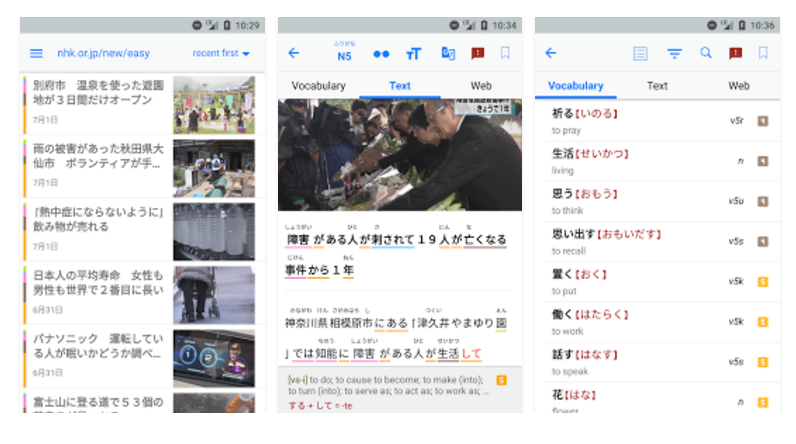 If I was asked to recommend a Japanese dictionary for an android user, I would always go with Akebi – there are other apps out there that work in a similar way, but I find Akebi to be the most user-friendly and reliable of the ones I have tried. When you search a Japanese word in Akebi it will give you the English definition and indicate other useful things such as how commonly the word is used and whether the word usually uses kanji or kana. For verbs, it will indicate whether it is an ichidan/godan verb, or if it is transitive/intransitive. Example sentences from Tanaka corpus are also provided underneath the definition. The app does sometimes pick up sentences that are not relevant to the word you searched but is about as accurate as jisho.org which draws from the same database of sentences. For words that are comprised of more than one kanji, it will indicate the meanings of the individual kanji which can then be tapped on in order to learn more about them. The app also has kanji/ vocabulary lists which can be sorted into 常用 (common use) or JLPT level. Similarly, you can create your own lists and then add words as and when you look them up. These can then be turned into flashcards which you can review in the same way as Anki. Whilst I haven’t used this myself in depth this is a neat way of creating your own personalised JLPT study list based on words you’ve looked up rather than a premade list. If you need more information on how to set up lists there is a really easy to follow tutorial for doing so. There are actually tutorials for all aspects of the app which is really useful for newbies. You are able to search words by typing in kanji, kana or romaji. In addition to this, you can search for kanji by writing it on the screen. The app will then bring up a number of suggestions as to what the kanji you are writing could be. I have found this kanji writing search to be very responsive – provided you more or less follow the correct stroke order, it will identify the relevant kanji. Having said that, even when I wrote kanji using the completely wrong stroke order it managed to identify it correctly! As you can see there is a lot to like about Akebi, whether you use it solely to look up words or not. I can easily recommend this to all Japanese learners irrespective of level, especially because the app itself is free from the Google Play Store! I haven’t gotten round to doing one of these posts in a while (believe me, it’s not down to lack of apps to review!) but I was inspired to write one after coming across the app TangoRisto. This app is a reading app but is tailored towards the needs of Japanese learners. Some reading apps are better suited to intermediate or advanced learners, but this has a lot of features which enable beginners to get reading in Japanese as soon as possible. TangoRisto takes its articles from NHK News Web Easy (for beginner-intermediate learners), Top NHK News (for intermediate-advanced learners) and Hukumusume (fairy tales in Japanese). If a verb has been conjugated it will indicate how it has been conjugated/ the politeness level as well as the verb in its dictionary form. When you tap on the vocabulary again you get further information on the word: it can then be bookmarked and added to a vocabulary list to review later offline. There is an option to search the word on websites such as jisho.org, Tangorin, Google as well as the Japanese Stack Exchange where you can ask questions on usage. The app is available for free on the Apple Store and the Google Play Store, so there really is no reason not to check this out! Find out more on the app’s official website. Ever had a burning question for a speaker of your target language but no one around to ask? HiNative is the app for you! This app has been around for some time but before trying it out myself I was quite skeptical, but I am a definite convert. It helps that the app’s mascot is super adorable! Why is the app recommended? When you create an account you can specify what languages you are learning and which languages/ countries you are already familiar with. Based on these choices you can see questions and answers on your language pairs which you can then contribute to. You can also record audio and ask native speakers to critique your pronunciation! It is particularly good for those who are learning languages where local native speakers are in short supply, which makes it a good choice for Japanese learners. There can be times whilst you are learning a language when friends who speak the target language are less likely to correct you on errors. Therefore getting a complete stranger’s input on whether something sounds natural or not is always a good idea. It is certainly true that when learning Japanese, the best thing is to ask a native about issues such as word usage; no matter how good your dictionary may be, it cannot always capture the unique nuances that certain words may have. I thought that HiNative was solely about language questions, but it can be a great way of asking questions about the culture(s) you are interested in. I saw lots of questions about music and TV recommendations, food culture, sports, etiquette, travel which sparked some interesting discussions. Ultimately as a language learning app, it attracts people enthusiastic about other languages and cultures and so people do their best to be encouraging. This kind of supportive community is just the thing you need to keep yourself motivated during your language learning journey. Even if you only have 5 minutes while waiting for the bus or brewing a cup of tea, you can be doing something productive by using this app. You can find the HiNative app on the App Store or Google Play store for free (though there is a premium version available) – find further details on the official website. Welcome to my series of app reviews relating to Japanese language study. Today’s app review is of the Japanese reading app Mondo. Have you been studying Japanese for a while but scared of reading articles in Japanese? Looking for a simple Japanese news aggregate app with dictionary lookup functionality? Then Mondo is definitely the app for you! I have had this app installed for some time, but after playing around with the app to understand more fully all of the features it has I can definitely recommend this to intermediate learners looking to improve their article reading skills. Article reading. All articles have a word lookup function when you highlight a word or phrase and includes a recording of its pronunciation by a native speaker. You can toggle furigana on or off, and some articles have links to the English translation to check your understanding of the Japanese text. Vocabulary lists. Words you come across in articles can be bookmarked, which then can be viewed later and added to a vocabulary list. There are also preset lists, with lists such as all levels of the JLPT, Joyo (general use) kanji and business-related language. You can then test yourself on this vocabulary in the form of electronic flashcards, Anki style. My only gripe with this is that with the preset lists testing from English to Japanese, the English terms can be so obtuse at times that coming up with the correct Japanese term can seem nearly impossible sometimes. Handshake is a feature you can use to find Japanese language learning partners. You can choose a partner by swiping right on the people you are interested in chatting with – if you get a mutual handshake, you’ve just found a language exchange partner! The obvious similarities to Tinder here have put me off trying this feature out, but it could be a good alternative to a dedicated app like Hello Talk. Study log. When reading articles, the app measures how long it takes you to read the article, and how long you have spent reading in total. It also measures Characters per Minute (CPM) which is used as a benchmark for what level the app considers your language learning level to be. I think that the above features packed into one app for free represents a really good deal. It is worth mentioning that there is a premium version of the app, which gives you access to audio recordings of each article (the free version lets you listen to one article every fortnight) as well as short dialogues by native speakers and costs 480 yen per month. For 1800 yen per month, the premium membership also grants you access to Japanese language teachers who are there to help you out with any Japanese related questions you may have. Given the prices, I am not sure if the premium membership represents good value for money, but as a free app, I am impressed by its current offering. If you are interested in checking the app out, it is available in the Apple store and Google Play store. You can also find out more about the app on the official website. The second installment for this series is a review of News Easy Japanese, another reading comprehension app. This news reading comprehension app issues 3-4 articles each day covering current affairs, in the vein of NHK Easy Japanese, having been written using simpler language than standard newspaper articles but still use a lot of the vocabulary that does crop up. Furigana can also be toggled on or off. Each article comes with sound clips where the article is clearly read and spoken at a steady speed facilitating easier reading comprehension. The items highlighted in green can be clicked on, and give simple definitions of the item in Japanese. I really like the Japanese-Japanese dictionary as it gives you the opportunity to understand new vocab using words you (hopefully) already know, and is especially useful for distinguishing between words which have appear to have similar English meanings. As you can see above, the app also has articles on various weather phenomena you may likely come across living in Japan (typhoons, tornadoes, heavy snow, heavy rain, tsunamis and earthquakes). This is useful for picking up relevant vocabulary relating to weather warnings which you may come across on TV. Being from the UK, earthquakes are not something I am used to, so having the opportunity to brush up on dealing with earthquakes is always helpful. The only real downside of this app is that it does not have any offline functionality. Apart from that, I can definitely recommend this app to JLPT N3/ intermediate level learners looking to practice their newspaper reading comprehension, especially if you are looking to move away from Japanese-English dictionaries.